Geochemistry of Organic Substances, Volume 28 correlates ideas regarding the composition and transformation of decomposition products of organisms in natural processes with phenomena of migration and the concentration of chemical elements by organic substances in sedimentary rocks. This book presents theories regarding the chemical structure of natural compounds that work as progenitors for the formation of naturally-occurring organic substances. Organized into two parts encompassing 12 chapters, this volume starts with an overview of the biosynthesis and the metabolism of organic substances that characterize the intermediate compounds. This text then examines the formation of fossil substances, which occurs in various stages and depends on several factors. Other chapters consider the role of the organic substances of coal in the geochemical cycle of carbon. 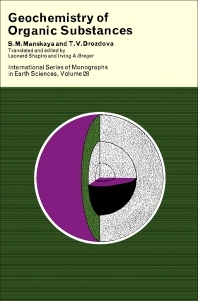 This book discusses as well the composition and distribution of the organic substances in water and sediments of basins of various types. The final chapter deals with the significant role of fossil organic matter at various stages of its formation. This book is a valuable resource for botanists, geochemists, paleobiochemists, and coal chemists.